You have got to see Lila Tueller's blog! Just the most gorgeous fabric and patterns:). The baby dresses that I made for Sophie are from her pattern. It was so easy to follow and it turned out great! 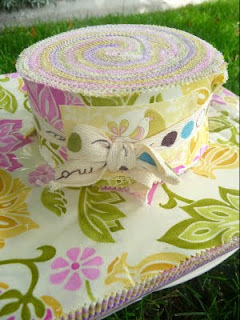 Well, she's having a contest right now for a Jelly Roll of her new fabric line "Eden". Go check it out ASAP! I'm debating heading to Quilt Market, but I swear I'd come back broke! Wouldn't it make a cute skirt for Miss Emma J? I will certainly link to the new blog and this one too, just let me now when it's up! That fabric IS darling. It looks so springy! The fabric is darling and it would look so cute on Emma.